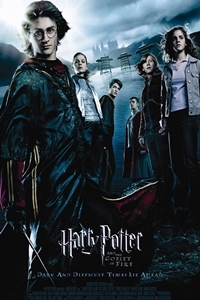 In "Harry Potter and the Goblet of Fire," Harry must contend with being mysteriously selected to compete in the prestigious Triwizard Tournament, a thrilling international competition that pits him against older and more experienced students from Hogwarts and two rival European wizarding schools. Meanwhile, supporters of Harry's nemesis, the evil Lord Voldemort send a shockwave of fear throughout the wizard community when their Dark Mark scorches the sky at the Quidditch World Cup, signaling Voldemort's return to power. But for Harry, this is not the only harrowing news causing him anxiety...he still has yet to find a date for Hogwarts' Yule Ball dance. The exhilarating Harry Potter and the Goblet of Fire takes the best parts of J.K. Rowling’s fourth installment and serves them up in one heck of an action-packed, albeit darker, film. Parents, be forewarned--this isn’t kid’s stuff anymore. Harry (Daniel Radcliffe) looks forward to a little peace of mind in his fourth year at Hogwarts. Alas, it’s not meant to be. Hogwarts is hosting the Triwizard Tournament, in which one champion from three prestigious wizarding schools competes in a series of life-threatening tasks. As the three competitors are chosen by the enchanted Goblet of Fire, it inexplicably spits out one final name. Guess who? Someone is obviously setting up Harry. His friends and professors try to help him, but Harry is pretty much on his own. Yet, as he edges closer to the Triwizard Cup, nothing can prepare the boy wizard for the ultimate confrontation with pure evil. That’s right, Lord Voldemort (Ralph Fiennes) is back, and boy, is he pissed. Dark and difficult times do indeed lie ahead. There’s a wonderful familiarity with the characters that keeps getting stronger with each film. The kids--Radcliffe, Rupert Grint and Emma Watson--are finally comfortable in their characters’ skin. Although they still have trouble hitting those dramatic notes, their adolescent camaraderie is genuine. With the new characters, the casting is once again impeccable. The Harry Potter movies have become a great way for prominent British actors to pocket a little extra change. Brendan Gleeson (Troy) is blusteringly hilarious as Alastor “Mad-Eye” Moody, the new unconventional Defense Against the Dark Arts teacher, while Miranda Richardson (The Hours) is aptly persnickety as the nosy tabloid-esque reporter Rita Skeeter. And then there’s Fiennes, playing the Dark Lord with exquisite maliciousness. Can’t wait to see what he’ll do with the role in future installments. Poor Mike Newell. Apparently, producer David Heyman originally wanted the British director--known for helming smaller, more intimate fare such as Four Weddings and a Funeral and Donnie Brasco--to direct the first film, The Sorcerers Stone. Newell had to pass at the time, and instead waited until he was offered one of the most complicated of the Harry Potter novels. Oh well, no harm done. Newell handles the spectacular special effects with style (with some help, no doubt) and adds to the franchise for the first time oh-so-veddy British sensibilities. He wanted to give audiences a taste of what a British boarding school is really like, even a school that teaches wizardry and witchcraft. Goblet of Fire is full of little eccentricities, especially between the professors, that keeps the magical spirit going in between all the action. Hollywood.com rated this film 4 stars.